Japundit reports on his attempt to fact-check a Kyodo news story on sumo wrestling by women. Based on his results, this is a subject crying out for authoritative study, with strong roles for gender theory, rhetoric of drama and, of course, the rising tide of sports history. I recently ran across two separate references to the Hideyoshi invasions of Korea, both of which credited Hideyoshi’s initial success to firearms. That didn’t ring true for a few reasons, the first of which is that I’m a professional Japanese historian and didn’t remember ever seeing that sort of assertion before. My impression was that the initial Japanese success was a result of having a large number of battle-hardened veterans against a nation which hadn’t seen large-scale combat in over a century. The ability of the Ming to throw the Japanese back when they committed enough troops (and really, not that many, though the Koreans were committing a great deal more) seemed to me to argue against a significant technological differential. I’ve sent a query to H-Japan, and the first reply I got back deepened my confusion. Andrew Dyche of UBC reminded me of the “Turtle Boats” which Korea used to such great effect against Japan’s military and supply ships. In that respect, at least, the technological advantage was in the wrong direction. I’m not a military historian by trade, but this doesn’t look good. A bit of google work (all my relevant books are at the office, and it’s summer, so I don’t get in much) led me to this article about why Europe colonized the world. It has some interesting details about the reported effectiveness of both firearms and turtle boats, but also relies heavily on pretty old sources (which explains why, for example, Japan after 1636 supposedly only traded with the Portuguese instead of the Dutch, Chinese and Koreans). Interesting, but not dispositive, and certainly not the original source of the idea. Nor are these sites, though they are typical of the genre. All of them seem to indicate that Ming military technology balanced the war (and the Turtle boats tipped it in the other direction). I suppose I’m going to need to go in and look this up, but if anyone knows of a good monograph on the subject of the 1590s wars I’d be grateful. Over at H-Japan, there’s a discussion about the Hinomaru, Japan’s national flag. I was intrigued and clicked over to Wikipedia. I also visited the the Japanese Wikipedia. This entry mentions that the Hinomaru had been used by Satsuma vessels, but then was later used as a sign of the Tokugawa Shogunate during the Boshin War(1868-9)! Supposedly the restorationists used a flag with the imperial Chrysanthemum crest. I did not know all of this, and I’m surprised that the Hinomaru was used by Tokugawa Loyalists. Does this suggest that the red circle was not always associated with the imperial throne? I don’t know. Anyone know what the politics was of using the Hinomaru around the Meiji Restoration and how it came to be a symbol of Japan? Or any prior use of the flag? Or any bizarre trivia? Hi, I’m Tak Watanabe, and I’ve just recently joined Frog in a Well. I am a cultural anthropologist who is keenly interested in the history of Japan. Currently a student at Columbia University in New York, I hope to complete my dissertation in the very near future. In the fall of 2005, I will start teaching anthropology at Sophia University in Tokyo. My dissertation is tentatively titled “After Prosperity: The Ethics of Restitution in Recessionary Japan.” It is based on ethnographic and archival research in Niihama, a city on the Japanese island of Shikoku known as a “corporate castle-town” of the Sumitomo business group. Nearby is the Besshi Copper Mine, which along with Ashio, Sado, and Ikuno, is one of the more famous non-coal mines in Japan. I primarily focus on how the city residents relate to this corporate group, and how this long-standing relationship is changing as the city undergoes a post-industrial and recessionary decline. You can read more about me, my research, and my other interests at my blog, The Old Revolution. Oh, and about the image above. To celebrate my induction into this august line-up of smart and knowledgeable frogs, I figured I’d just post my favorite two-dimensional Japanese batrachian: Pyonkichi from the 1970s manga, Dokonjo-gaeru. And he’s two-dimensional not only because he’s a manga character. In fact, he is a flat frog, squished onto a T-shirt of a middle-school boy! Hi I’m Tak Watanabe, and I’m new here. (Thanks Konrad for the invite!) I’ll post a self-introduction soon, but in the mean time I wanted to post something up that I thought might interest the historians here. Over at Mutant Frog Travelogue, Adamu has directed our attention to a humorous piece of historical fact he culled from the ever resourceful Wikipedia. While the May 15 Incident (五・一五事件, occured in 1932) is famous for the assasination of Inukai Tsuyoshi, the Prime Minister at that time, I had no idea that it also involved a plot to assasinate Charlie Chaplin. Quite a find there, Adamu! Here is a photo of Inukai Tsuyoshi, taken from the wonderful image depository of portraits of famous Japanese historical figures, housed at the National Diet Library webpage. [I had linked the same photo from the Chinese wikipedia entry on him, but it was mysteriously taken down]. The incident is noted as a precursor to the more famous February 26 Incident in 1936, during which the Emperor had to end up ordering the suppression of the coup led by a cadre of young military officers. Yet before quelling the revolt these officers had been able to rub out key cabinet members, thereby effectively consolidating military power in Japan. 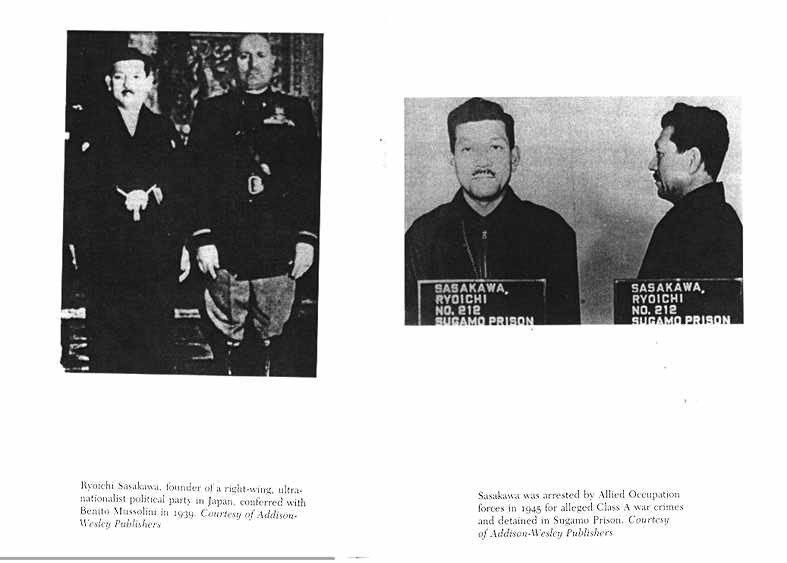 Anway, going back to the May 15 Incident, it should be noted that Inukai was regarded as someone who had been wary of the military, especially after the Manchurian Incident in 1931. According to my trusty Concise Dictionary of Modern Japanese History, compiled by Janet Hunter, he was against the hanbatsu bloc (the Saccho clique) and became a defender of constitutionalism. I was always under the impression that Inukai’s famous last words of diplomacy, before his death by the hands of the military officers, were something like “Let’s talk and come to an agreement” (「話せば分かる」). Yet according to the Japanese wikipedia entry on the Incident, it is just a myth concocted after the fact. He is, along with some other noted historical figures, buried at the Aoyama Cemetery in Tokyo. This week’s Japan Focus brings discussion of the past, present and future of the Japanese imperial institution. I’m particularly intrigued by the story of the researcher who used Japan’s Freedom of Information laws to pry documents out of the Imperial Household Agency, and how those documents may shed enough light on the arbitrary nature of “Imperial” tomb designations to jump-start the stalled process of studying the mounded tombs great and small. I’m happy to announce that today, the second of the Frog in a Well blogs, dedicated primarily to Chinese history, is officially launching and the more than half a dozen contributors will hopefully soon introduce themselves and begin posting! 井底之蛙, or Frog in a Well – China will be followed by a Korea focused weblog sometime later in the summer or this coming fall. I’m a Ph.D candidate in the history department at UC Irvine currently doing dissertation research in Tokyo. I work on the historical memory of the Meiji Restoration, in particular how different people from 1868 to the present appropriate and create the image of Oguri Tadamasa, a Tokugawa ‘martyr’ during the Restoration. How do they appropriate him? For what reasons? How do people offer alternatives to accepted master narratives of the Restoration by using Oguri’s story? These are some of the issues I deal with in my dissertation. I’m also interested in the spread of martial arts among commoners during the bakumatsu period. This project I started several years ago and continue to gather materials for the future. However, the foundations established in his name pour money into Japan related research as well as humanitarian projects all over Asia and Africa. Antti admits to accepting Sasakawa money to work on his PhD thesis and I too have accepted the “tainted” war criminal’s money in 1997 along with a Danish friend of mine through a Scandinavia-Japan culture scholarship they offer. This money helped defray our living costs at the Inter-University Center in Yokohama where we both studied Japanese. I have to confess I was somewhat uneasy about accepting the money at the time, but I don’t think I would have any doubts about it today. Ethical issues like this related to funding arise in many situations but despite the despicable ideas and actions of the original source of the money, I think this is probably one of the clearer cut cases for me. Like many other projects funded by his money, we are not obligated in any way to continue, support, or I believe even remotely legitimate the ideas and actions of the man. 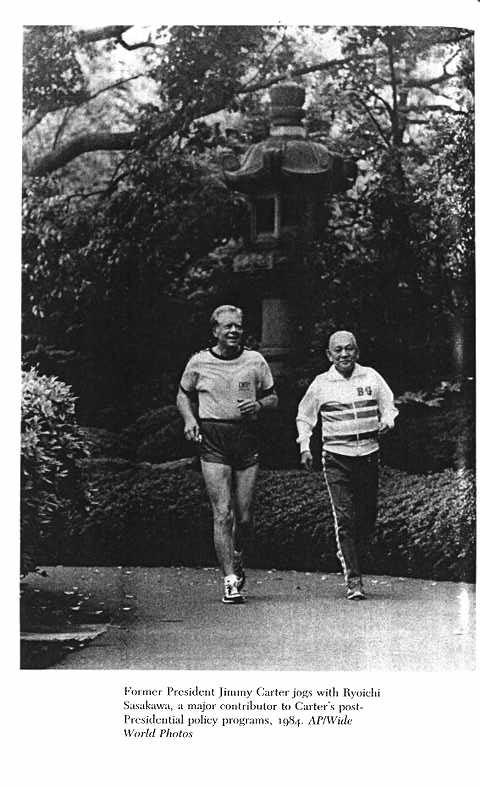 Unlike Jimmy Carter, who apparently also got quite a bit of money and support from the man to support his policies, none of us need to go jogging with the deceased scoundrel to show our gratitude. In Learning Places and History’s Disquiet, scholars such as Harry Harootunian have discussed the many problems associated with academic funding and area studies in general. While I don’t agree with all aspects of this critique, it brings up important questions. I have recently heard a number of disturbing stories related to funding ethics involving certain Asia related programs in the US where some supporting institutions influence research topics, ask that their favorite (and occasionally controversial) native academics be given visiting scholar support, and in many other ways force professors or departments to participate in the legitimation of certain nationalistic or extremely politically charged mandates. Staying just on the US side, I cited one small example of the close connection between the US military and China academic studies in the US that I came across in my own studies on my own blog here. I don’t think we have that kind of case with Sasakawa money, at least not some of the scholarships that Antti and I have taken advantage of. This is, however, and important issue and one which especially touches academic programs doing research on a particular country or region. Your own anecdotes and thoughts are welcome. Just wanted to mention that there is a new academic group blog in town dedicated to Anthropology. Like Frog in a Well, Savage Minds is maintained by a number of PhD students and professors in the field and is aimed at bringing its study to a wider audience as well as discussing the latest research in the field. The spread of academic group blogs is exciting and will hopefully continue as more graduate students and professors realize the uses for the medium. On that note, I want to mention that Frog in the Well will also be expanding in a few days as we get our China history group blog underway. Stay tuned.